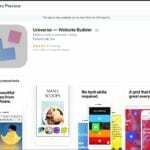 Universe Website Builder Review - Build a Website from Your Phone? Would you like to have the ability to build a fully functioning website on the go from your cell phone? If so, you’re not alone, and supposedly the company Future Lab, Inc. has you covered with their new app, the Universe Website Builder. In this Universe Website Builder review I’m going to be looking at exactly what the tool is, if it works, if it’s your best option and if it can really create great-looking websites in less than a minute from your cell phone. Without further ado, let’s get started and see if this tool is the one that you’ve been waiting on to help you create websites on the go. What Is The Universe Website Builder? 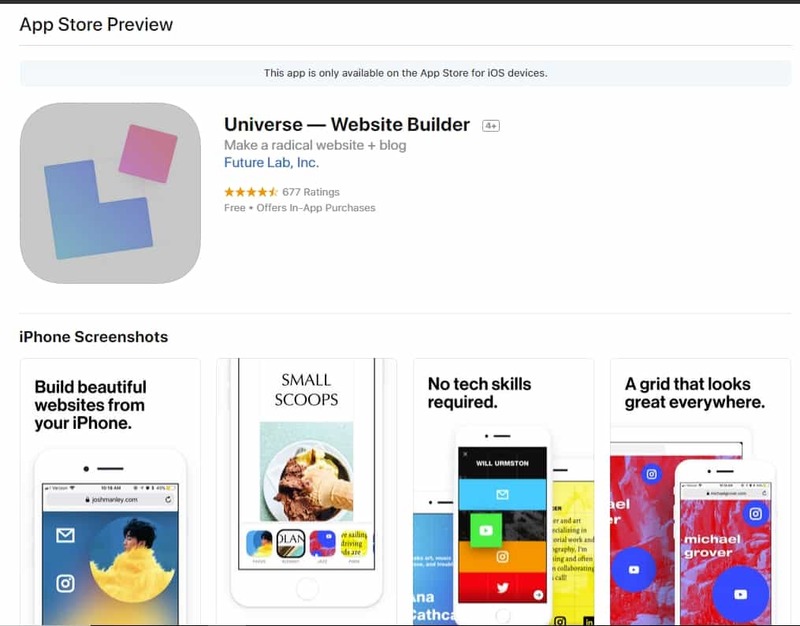 Created by Future Lab, Inc. the Universe Website Builder is an app available for Apple devices that promises to help you “make a radical website + blog” from your mobile device with no design skills needed. I could see the Universe Website Builder being a decent tool for a couple of different situations. First, if you already understand the basics of coding, it could be used to create very simple landing pages for product offers or email opt ins. The other situation where this tool could be useful is if you’re needing a very simple web presence that serves as a way for people to get in touch with you on your other channels such as email, Facebook, Instagram, etc. Before you make the decision to use this app however, there are a few things that you need to take into consideration. Sadly, there’s a very dark side to this app, and I’ll get into it a little bit more in the review below. Like many other apps inside of iTunes, this one is free upfront with several in app purchases available. You can use the tool and create a website as a subdomain of their site for free. After that, the costs of the app can become kind of crazy quickly. If you’re wanting to create a true business presence with the app, there are a lot of fees that you’re going to have to pay monthly that you wouldn’t have to pay elsewhere. In total, I’d be spending almost $9 / mo just to have a single page site with analytics and no third party branding. This would cost just over $100 per year. In comparison, you can purchase a domain with bare bones hosting for just over half that price elsewhere. If you’re just looking for a domain name, you can grab them for about one-third of Universe’s price from other registrar’s. In my opinion, you just don’t get enough bang for your buck when it comes to the in app purchases this tool has to offer. When I first heard of this app, I thought it was a very interesting concept. I mean let’s face it, all of us are leading lives that are busier than ever before, and being able to design websites on the go would be handy. So, I wanted to give it a go and see if it would stand up to some of the hype that it’s receiving. 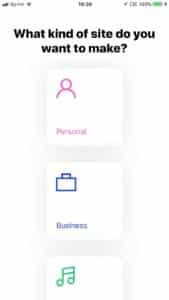 When you first launch the tool, you’re given the option to select between a few options including; personal, business, creator, event or blank canvas. The option that you select will allow you to create different styles of quick single page sites and choose from different included themes that are different depending on what kind of website you’re creating. It’s very simple and straightforward. However, I did notice that they were placing quite a bit of emphasis on upgrading your domain. 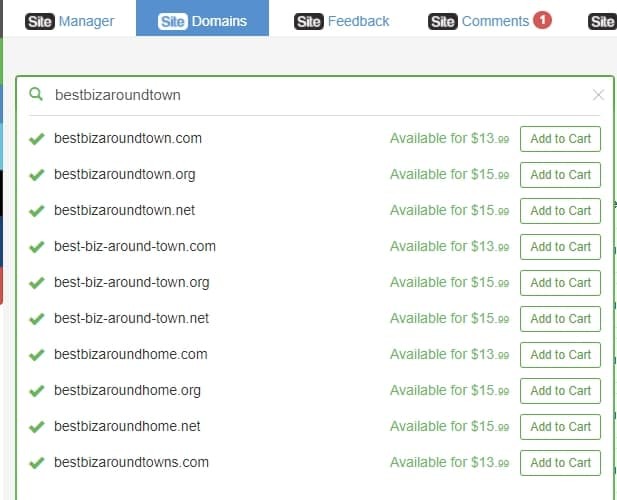 On almost every page, there was some option to choose to “upgrade your domain” that would take you to a page where you are able to search for available domains and see how much they would cost you monthly. There were a couple paragraphs inside of their Terms of Service that were very scary to read. First, I noticed the section pictured below regarding domain names. 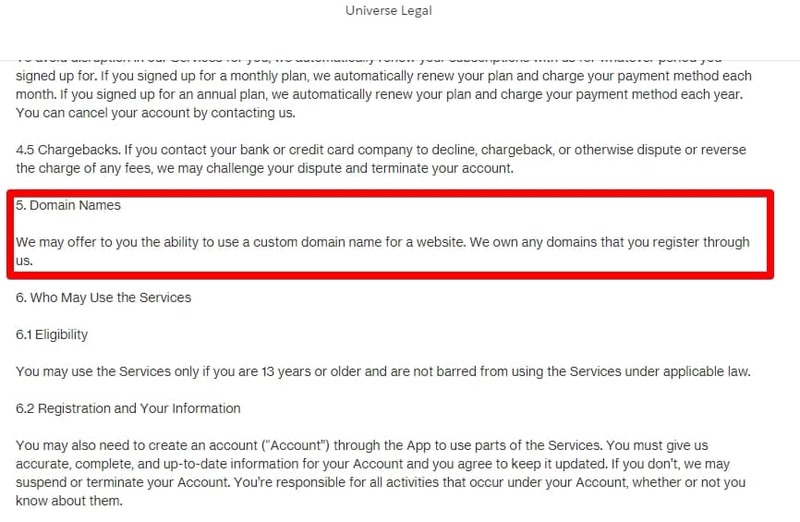 If you register a domain name through the Universe app, you don’t actually own the domain. Instead, Universe owns the domain and just rents it to you. While this may not sound like a big deal upfront, it’s actually an extremely scary notion. This is especially true when you consider the next paragraph pictured below from their Terms of Service. 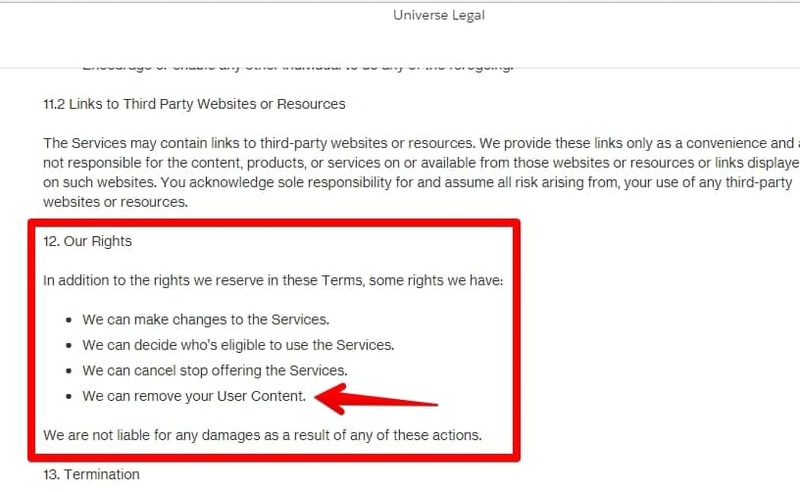 That paragraph gives Universe Website Builder the right to remove your content for any reason and leaves you with no legal action to receive damages from the loss of your site. So, think about this in a worst-case scenario mentality. 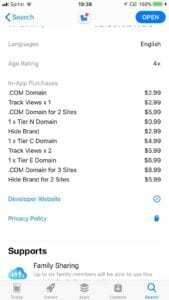 Let’s say you buy a domain through the app and create a website. Let’s say you’re able to successfully get traffic to your new site without any training. Fast forward six months or a year and you’re seeing regular visitors coming to your website day after day. Universe Website Builder takes notice and sees just how much traffic your site is getting and that it could be worth a significant amount of money. They then decide to remove your content and sell your website to the highest bidder. According to their Terms of Service, they are completely within their legal right and you have no action that can be taken to recover from your damages. Now, you’re left without a website, and all the hard work you put into it for traffic generation is now lost. Yes, again this is worst-case scenario and I’m not saying that it would actually happen, however according to the Terms of Service for the app, it certainly could. Now, with worst-case scenario out of the way there were a couple of other things that I wasn’t particularly crazy about when it came to using this app. While I didn’t expect the tool to have the same kind of design functionality as WordPress or other similar platforms, I was disappointed by the included tools that it does offer. In the design tool, you’re presented with a three square wide area. By clicking on plus signs in each square, you can choose from a few different options to create content inside of that area. The options you have available for these blocks are things like photos, videos, text, links and a custom code widget. You are able to change the background color of your blocks, and if you know how to code, you can add some quick code snippets for things like email opt in forms. Unfortunately, you are not given the option to change the dimensions of your site at all. While it looks great on mobile devices, it appears very thin when it comes to loading your website on a desktop as you can see in the image below. The site you can create do look great on mobile devices, but they lack reverse responsiveness to desktop resizing, in my opinion. Aside from its’ limited design and questionable Terms of Service, the last issue that I had with this app was the fact that there are very limited SEO options available inside the tool. The SEO functionality of this tool is basically nonexistent. Yes, you do have the ability to create posts and pages for your site, however it does lack basic formatting functionality such as headings. On top of that, due to the non-responsiveness of the app for desktop devices, your bounce rate is going to be most likely be very significant when it comes to trying to get people to view your content from home. Even though the app is very easy to use and simplistically designed, I think that perhaps they have went a little overboard when it comes to its simplicity versus its ability to help you create a successful website. As mentioned above, this tool is great if you’re just needing a single page website that serves as a directory for your other online presences. If this is the case, just use the free domains that are included with the tools free price. The app does live up to the hype of being able to create decent looking websites on the go with no design experience. However, there are a lot of better options out there that will do the same thing without the risk of dealing with such a questionable Terms of Service Agreement. While I imagine the worst case scenario in regard to their Terms of Service, the company has worded it so that they could potentially take your website and sell it to the highest bidder without you having any rights to receive compensation for your damages. As mentioned above, these sites can look great on mobile devices, however they lack backward responsiveness to desktop devices. If you’re using their premium services such as domain registration and brand removal, you’re going to be paying almost double what you would be elsewhere. The app itself is very easy-to-use. With that said, there are a lot of other things you have to do behind-the-scenes if you want to have a successful online business. Unfortunately, this app offers no training whatsoever when it comes to building a successful online business. while I didn’t expect the app to have stellar SEO functionality included, I did expect to see at least basic SEO options such as headings. Unfortunately, even these simple SEO tools are missing from the creator altogether. While creating a website on the go is a fantastic idea, unfortunately this tool doesn’t have a fraction of what is necessary to run a successful online business. If you’re wanting to create a simple one-page landing page to collect emails or serve as a directory for your other online presences, this tool could be beneficial as long as you are using one of their free domains. If you’re wanting to create a successful online business, then you’re going to need a lot more power when it comes to website creation. Thankfully, even though you need more power, it’s still very easy to get started with your own online business today if you’re following a proven method of creating online success. 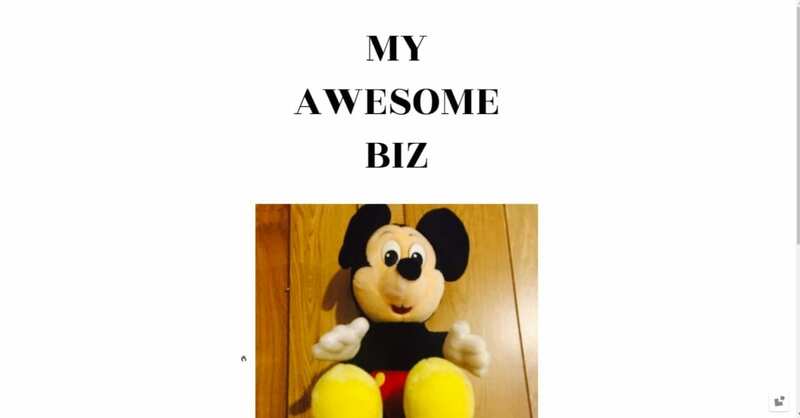 If you’re ready to get started with your own online business, check out my top recommended resource to learn how you can build a website that you will own and is designed to generate revenues for you both now and for years to come. Wow! That’s a really scary TOS. I can’t believe that a company actually has the ability to not only remove your site, but actually sell it to the highest bidder! Thanks for the great review Jay, I know I’ll be staying away from this one. 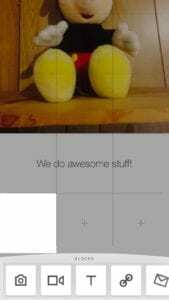 On a side note, do you know of any good mobile design tools? I have to agree that it’d be kind of nice to be able to publish on the go. This does look like an intriguing option for creating a one-page landing page on mobile. But like you said it does not play well on desktop and I fear that we could potentially see a negative effect on your business since it would render as to simple and almost unprofessional looking on a desktop. Yes, the trend is to mobile, but it appears that these folks have completely ruled out the desktop aspect of a website. This is great information and very helpful to show that you can get much better value for much cheaper and have full control of your website. Hi, Jay. Thanks for letting me know about the Universe Website Builder. It sounds like a limited-function product that might look good on cell phones, but my problem is that in my old age bigger is better. I have the plus version of my iPhone just for the bigger screen. I don’t see any scenario where I would want to have a website built from my phone. It’s just too small for me to work with. Also the policy items you pointed out about ownership, content, etc. are enough to scare me away. I had never heard of Universe website builder for your phone before and am not to impressed with it. Why would I want to build up a nice traffic flow only to give it to them? Why would most people want this app as it seems expensive and I don’t see how you could build a good stable business with it. Thanks for the review, sure opened my eyes. I really enjoyed your review about the universe website builder. Like you said it looks like it would be good for someone just wanting to have their presence online —but other than that I don’t see much use for it. Also I’m glad you looked at the terms of service (because I know I wouldn’t have). That really is crazy they can can do anything to your website without any warning, because technically you don’t own your website. I think I will stick to buying my own domain names and hosting through more convential means, then use this app. Ahhh hell to the nah. Just the fact I don’t really own my domain and they can deleter my content at any point is a deal breaker for me. If you’re actually trying to build a real business online, this should scare the bejesus out of anyone. And the fact there isn’t any real SEO and training to help you promote your site is another negative. If you’re not using this to build a real business, then I guess it’s fine. But for me this is a no no. Thanks for the review Jay. It was very enlightening. I love the idea of being able to build a website via a smartphone app but I still believe there are certain things that are better one with a real laptop or desktop.